Over the past 10 years, AVC has been led by a D-1 point guard. The team is built around the point who sets the example in practice/workouts/games. He gets the ball to all of the players at the right time at the right place. And, if necessary can become a scoring machine. With their point guard graduating(Ismail Ali heading to D-1 Bowling Green State University), AVC has picked up Sophomore Jalen Etienne 5’10 175. Energy man on the floor both offensively and defensively. Absolutely hates to lose! Tough guy. Rocket fast and great point vision. A graduate in 2013 from West Mesquite High School just outside of Dallas, Texas, he was being recruited by multiple D-1 universities. Although he had his grades, his ACT score was not adequate. He thought his D-1 college basketball career was history until he met Coach Murphy Davis then from Glendale Community College. It didn’t take long and Jalen took over the starting point guard position. He led Glendale to one of it’s most successful years in their history playing into the state playoffs. Etiene averaged 11.6 ppg shooting a red hot 42% from beyond the three point line. He was named first team 2013-14 Western State-South all-conference team at the end of his freshman year and expected a big sophomore year . Instead, fate stepped in. His head coach Brian Beauchemin, required major surgery and Assistant Coach Murphy Davis left the team as well. 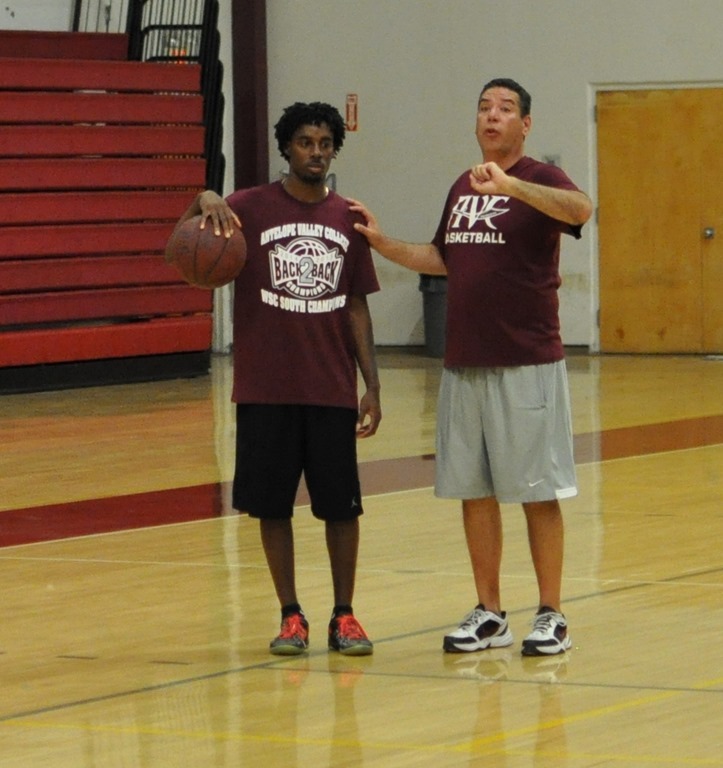 Jalen followed Davis and took the year off and when Coach Davis was hired at AVC, he joined the AVC squad. Jalen Etienne is thrilled to have the opportunities to have the chance of leading the AVC team. Jalen is expecting an outstanding sophomore year in basketball and academics that will lead to a D-1 scholarship and a state championship ring. Jalen was invited the All-American Tournament-Elite 80 in Las Vegas to play against to top JUCO players in the Western US. Jalen had over 150 University coaches watching him and he had two D-1 teams with serious intensions on his future. Many other teams love the way Etienne handles the team at the point. What a year for Jalen Entienne! Second straight year as first team all-conference player. He led the team to a 25-7 record and SoCal final 4 in the state playoffs. He was named on the AVC and the Chabot All-Tounament team and MVP in the Glendale tournament. Refused to lose.